The things we'll talk about as we wait for the 2012 schedule and to avoid certain spring football news stories involving Montel Harris and Ifeanyi Momah: logos! 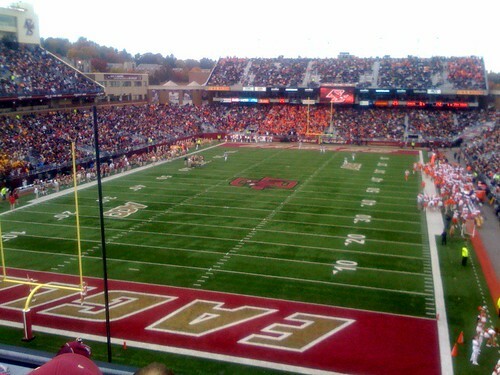 ...or, should I say, a theory about the graphic design image of Boston College athletics. 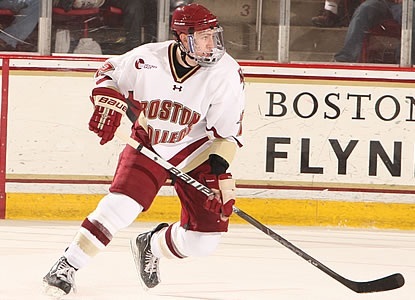 After 40+ years with an interlocking "Block" logo that included the flying Eagle, BC updated its entire athletic department to the modern day "slanted" appearance it generally has today across all sports. While there have been uniform tweaks across all of the different sports since the initial switch - some of them small, some of them drastic, including the 2007 change for the football team to the "Philadelphia" eagle uniform that seemed to make those slanted numbers even bigger - there was no bigger shift in recent years than to the new uniforms unveiled last year. While UA had held off making any sweeping changes in its first year, it was just a month past it's anniversary that the first drastic change appeared. I actually went and bought a Montel Harris one of these, road white since I have a Matty Ice one in maroon. Looking at the jersey, something stood out to me: the only place that the "slanted" logo appears is on the label. It isn't on the shoulders or sleeve. This is a far cry from the original post-logo-change uniforms, which had everything from the interlock to the flying eagle to the "Philadelphia" eagle. There were plenty of complaints - it's easy to make fun of the stained glass (although I like it), even if they went over the top with the extra stripe on the road helmet - and one for sure was the size of the numbers. I think it's more important to note that the numbers are rounded and without emphasis; or, well, at least I do now. The impetus for my focus is that the change didn't stop there, and spread to the other high profile team (this season): hockey. The hockey team has had three different outfitters in the last six years - switching from Nike to Reebok no sooner than a week after Reebok bought CCM (the last connection BC had to the swoosh), and then from Reebok to UA in the overall change in 2010. The last iteration of the Nike jersey, the Reebok ones from 2006-2010 and first-year-UA jerseys for 2010-11 are all nearly identical in look, just different chest logos. 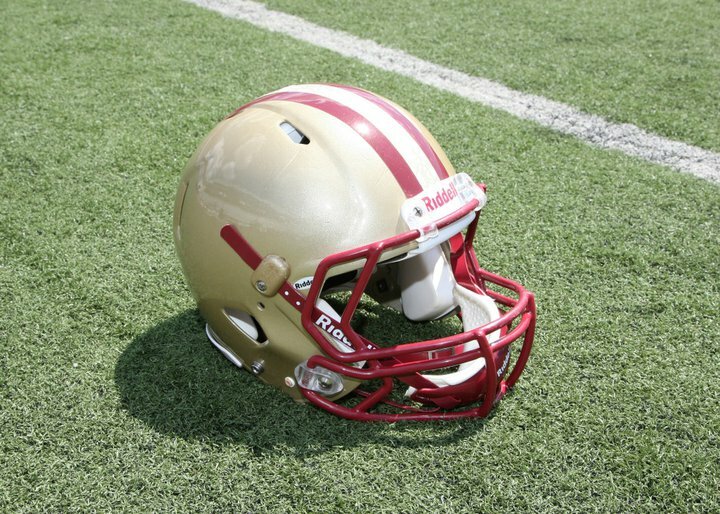 Again, though, the second year of Under Armour brought about some significant change to BC's image. There are a few cosmetic differences on the front and piping (stained glass again on the elbows) - generally, a similar look and feel although it does appear to be a little rounder in the font, but that's a bit of imagination, too. The backs, though, offer more of a look of change. Here are the first year UA jerseys; the numbers are slanted along a flat nameplate above the digits. Look closely at a few shots from last week's home series with Merrimack: the sleeve number, back numbers and nameplates are flat again (and oh my does Jerry look like a gentleman). Just like the football team, the interlock logo that had been prominent (on the upper sleeves in this case) is completely gone. Could it be a team-by-team change? Sure. It's not easy or cheap to completely redo a school's image in one fell swoop - especially given the signage throughout Alumni Stadium, Conte Forum and the athletics complex. The hardest change of all would be the field itself, which embraces the slant in the end zones and center field. Cue the opportunity window and my theory for bringing up this potential change now: BC is installing a new field in Alumni. If there is going to be a sweeping logo alteration to something that isn't slanted and slightly rounder (I'm thinking something closer to the "vintage" inspired Banner '47 interlock). We all know I'm way, way wrong about schedules. If I'm in fact right about this, my only request is that the logo never gets on the helmets.